As summer rolls to a close, it’s still very warm here in Albuquerque. Certainly not hot, but warm enough that a stew or slow-braised dinner just does not sound appealing, either to cook or eat. These summer rolls are perfect, though. Ground pork is combined with two heads of garlic (yes, you read that correctly) and sugar. 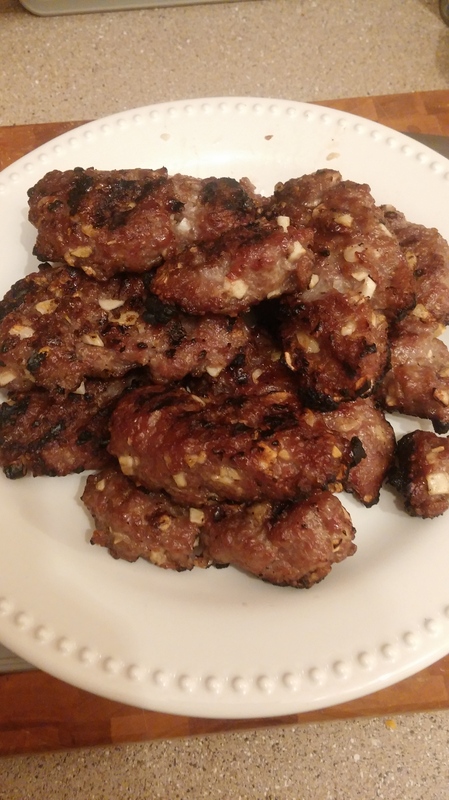 Formed into patties and grilled, the fat in the pork renders, the garlic roasts and the sugar caramelizes, resulting in meaty, sweet, savory and just generally delicious little nuggets. Combined with quick-pickled daikon and carrots, fresh herbs, lettuce, cucumber and wrapped in rice paper, this is the perfect dinner for hot weather. 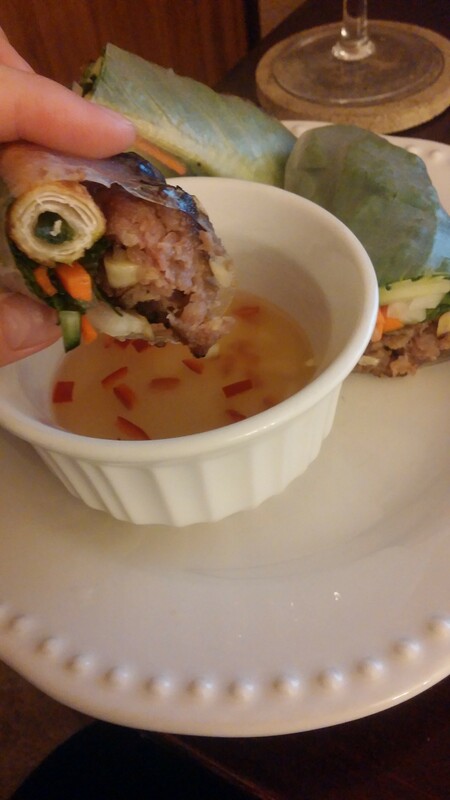 Add a zippy dipping sauce and you have a wonderful little slice of Vietnam on your plate. I’ve not had the opportunity to travel in Asia yet, but I do have a love affair with most Asian cuisines. One of my favorite things about cooking is that you can learn so much about a culture and the people who make up that culture simply by making and eating the foods. It’s like a tiny little trip to the respective country. This is especially true if you can find a restaurant that is well-decorated and authentic to the foods they serve. There used to be this little French bistro here. It was right at the boundary of our downtown area. It was a small restaurant, maybe at max 20 people could dine there at a time. The ceilings were high, the building was one of the older ones in town, across the street from a Basque-inspired building. Small black and white tiles made up the floor. Your server set down an amuse-bouche of chilled vermouth with house-made pate and pickles on baguette slices as soon as you were settled at your table. Soft French music played in the background. French wines almost exclusively made up the cellar. Fresh peaches sat on the bar, both as decoration and featured in the galette that was on special for dessert. The food was amazing and artfully presented. Both Ethan and I felt we had been transported to Paris for a few hours. It was incredible. While this is very clearly not a vignette of a Vietnamese, or indeed, even Asian, restaurant, it does show how clearly that between the setting and the food, one can feel in a different world entirely. I love being able to create small little snapshots of the globe in my kitchen. There’s something humbling and quite beautiful, really, about being able to sit down to a home-cooked meal using ingredients and techniques indigenous to peoples hundreds, if not thousands, of miles away. Food and cooking are powerful things. A taste of a dish, a whiff of an ingredient, can transport someone to that beautiful Italian villa they honeymooned at, or the distinct smell of kaffir lime leaves may give someone a flash of their village in Thailand. Food is truly something intimate. At its most basic, you are giving the body sustenance. At the more complex end, you are nourishing someone’s soul, relieving homesickness, bonding with a group of friends. A good meal can do more than some narcotics to bolster spirits. The point I’m trying to make is that sometimes stepping out of your comfort zone with ingredients or techniques can be a uniquely liberating experience. If you’re anything like me, when a new recipe or ingredient piques your interest, you want to learn more about it. Its origin, uses, what it means to the people who use it in their everyday lives. Enter fish sauce. I know it’s a totally alien and exotic thing to most American palates, but fish sauce is really quite a versatile condiment. It’s used commonly throughout Southeast Asia and like its Japanese cousin, shoyu, is often used to bump up the umami flavor in almost everything it is used in. For those of you unfamiliar with umami, it’s a relatively new (at least to the Western world) culinary term. At its most basic, it can be described as a salty, distinctively savory flavor. It’s really quite difficult to describe. However, once you can kind of figure it out, you begin tasting it everywhere. Scientifically speaking, umami is most present in foods containing monosodium glutimate, more commonly known as MSG. Before you go screaming off in horror at those three letters, please understand that MSG occurs naturally in a great many foods. Everything from Parmesan cheese, soy sauce and its derivatives (shoyu, tamari, etc. ), fish sauce, and kimchee all have quite a bit of naturally-occurring MSG. It’s what makes all those flavors so strong and distinctive. So what does kimchee and soy sauce have to do with fish sauce, other than the strong presence of umami? Fermentation. Fish, such as sardines and anchovies, are fermented with sea salt and the liquid produced from this is fish sauce. The oldest versions of this process start in a very different part of the world. Both Ancient Greece and Rome had versions of fish sauce that was shipped all through both empires. This sauce was called garum. 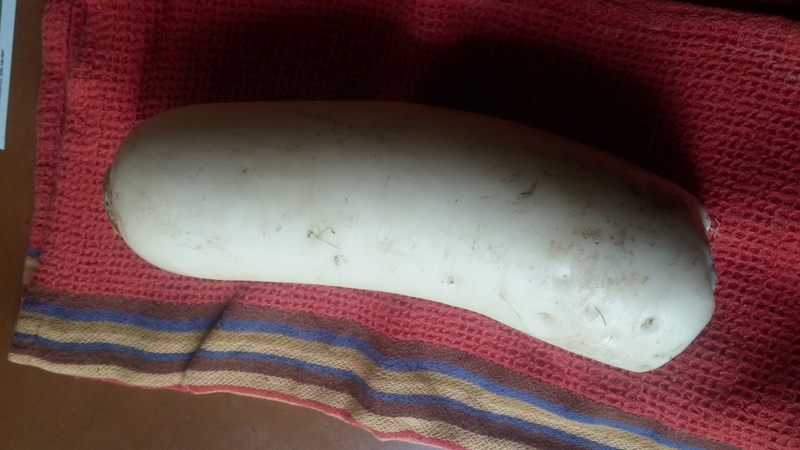 Although a different sauce resulted from this Mediterranean cousin of the current version, the basic process was very similar. Again, fermentation. Fish sauce caught on in Southeast Asia right around the start of the Middle Ages and some have hypothesized that the Silk Road brought the process into Asia. However, from what I can tell, there’s not a ton of evidence for this. Plus, at this point, garum was a fading ghost of the Empire in Europe and therefore not commonly used. Once the sauce established its roots in Asia, it hasn’t let up since and has become ubiquitous to Vietnamese cuisine. If you’ve been afraid to try fish sauce due to its name or its strong aroma, you should give it a shot. It has a slightly sweet, nutty flavor; very full-bodied. It’s actually not really very fishy-tasting at all. And that sharp aroma? When mixed with other ingredients, that bouquet is tamed considerably. If you’ve ever ordered summer or spring rolls at a restaurant and had the sweet, non-peanut dipping sauce that usually accompanies the rolls, you, my friend, have had fish sauce. See, it’s not scary, is it? To make these great rolls, the first step is to make the pickled vegetables, also common in Vietnamese cooking. These add a bright, crisp, slightly vinegary flavor that really helps show off the herbs in the rolls. 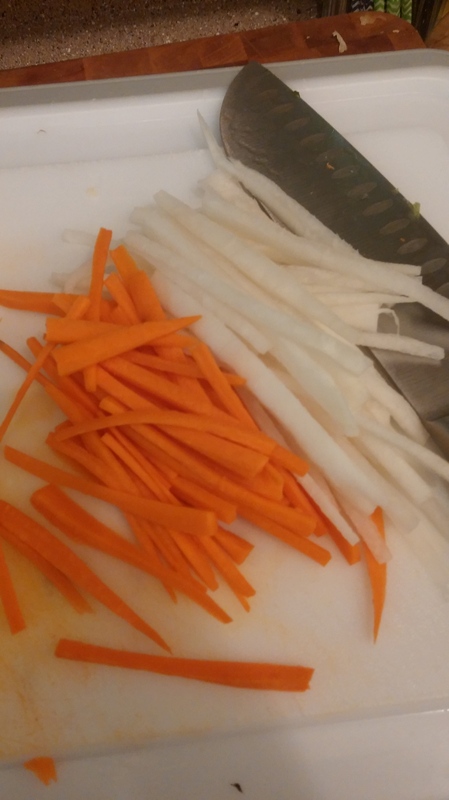 I’ve found it is best to slice the daikon (a root vegetable, related to the radish) and carrot into matchsticks. Soaking them in salt, sugar and rice vinegar makes for a lovely addition to the rolls. 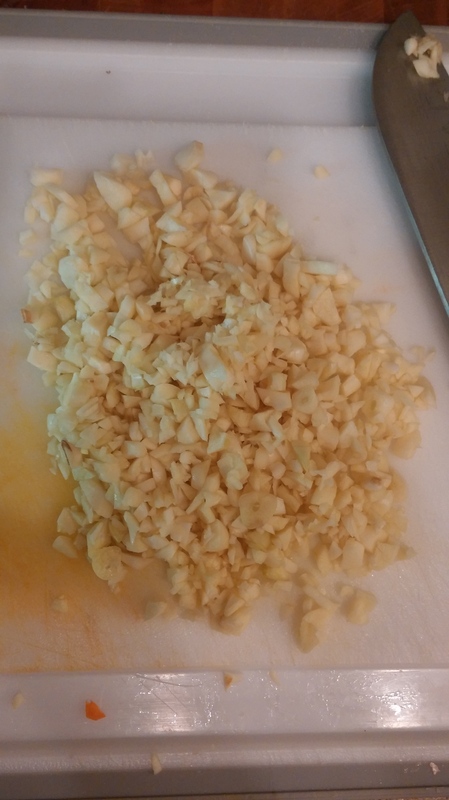 Next, you’ll add two heads of minced garlic to a pound of ground pork. I know that sounds like a lot; it is a lot. But it’s worth it. Trust me. Just go with it. Trust. Add some sugar into this, along with a packet of Alsa baking powder, and mix everything together with the pork. Allow the mixture to rest in the refrigerator for at least an hour to allow the flavors to come together. What the baking powder does is add a certain lightness in the texture of the pork. Obviously, you can make it without the baking powder, but I do prefer it with. After the rest in the fridge, form the meat into patties and grill. If you don’t have a grill, you could easily do this on a George Foreman or simply pan-saute them. If you have a grill pan, this would be a good recipe to break that bad boy out. However you choose to cook the patties, make sure the temperature is high enough to get a good sear and crust on the patties. No one likes grey meat. Blech. One thing I really like about this recipe, and that I hadn’t seen before, is that uses egg roll wrappers to wrap up fresh chives. 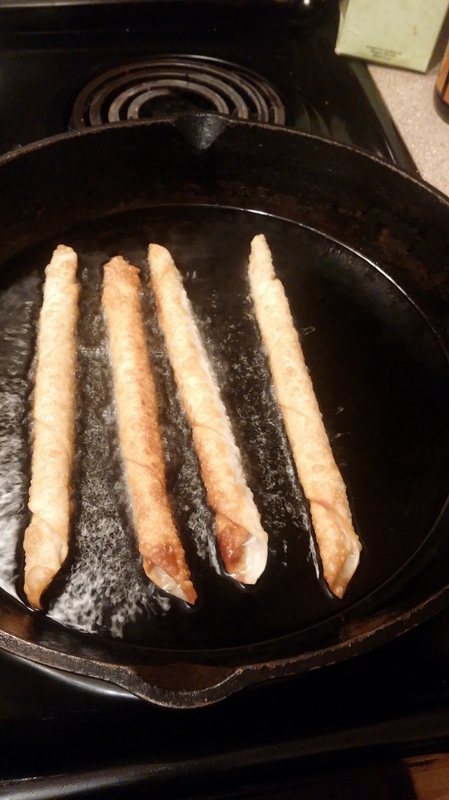 These are fried and added to the rolls. It adds a really awesome texture and even more herby flavor from the fresh chives. They also add a great visual aspect to the final rolls. Once the patties are grilled, get the greens together. I like using a crisp lettuce like romaine hearts, butter lettuce or even iceberg. It adds a nice crunch. 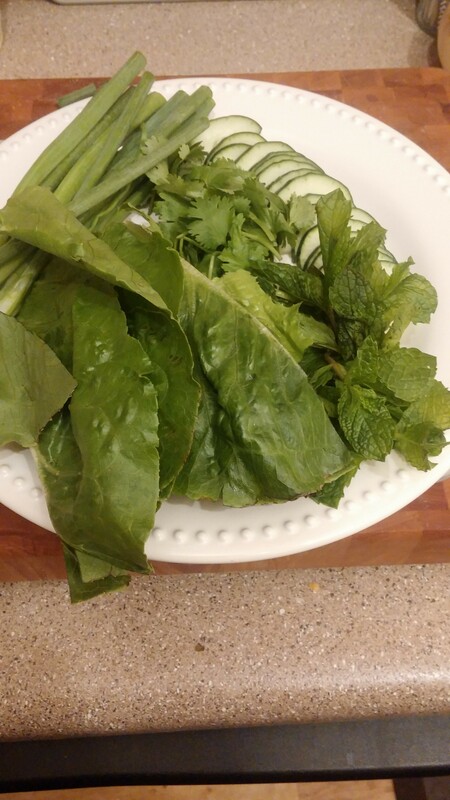 Cilantro, mint, Thai basil, sliced scallions, lettuce and cucumbers are all fairly traditional garnishes. Some fresh, sliced jalapeno would also be lovely, if you want to add some heat. Once all the components are ready to go, heat up a few quarts or so of water. You want it hot, but still able to tolerate the heat on your hands. This needs to be in a large, wide bowl in order to hydrate the rice paper. Take one sheet of rice paper and dip it into the water, rotating as necessary to make sure all the sheet has been dunked in the water. You want to make sure that the sheet does not fall over onto itself, or else you’ll end up with a blob you can’t really use. Transfer the rice paper to a plate or large cutting board. Now for the best part! You get to assemble your roll with whatever you want! I like to start with the meat patty down first, slightly off center. I then add the egg roll wrapper next to it, followed by a bit of lettuce on the other side of the patty. Add some of the pickled daikon and carrot on top of that. Add whatever herbs take your fancy on top. I like to finish with cucumbers on top. If you look closely, you can see the sphere of the rice paper. It’s delicate, so be gentle in handling it, once hydrated. After everything is in place, wrap it up like a burrito! Fold the top and bottom towards the center, while simultaneously pulling the fillings slightly towards your non-dominate hand. 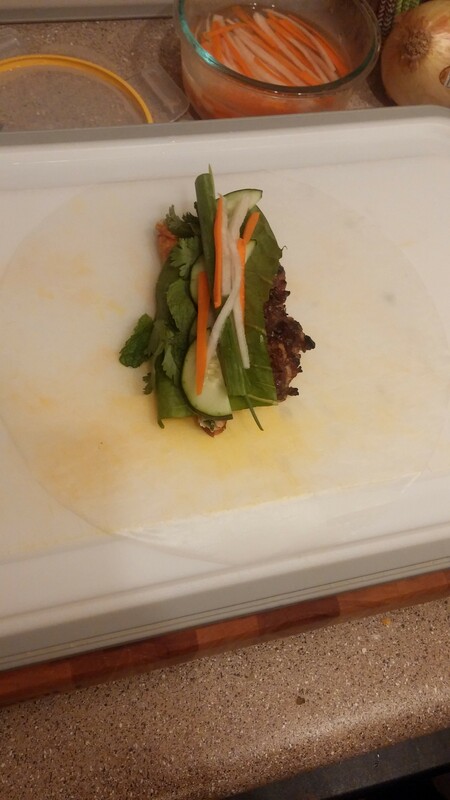 Wrap the side as fully over the fillings as you can without breaking the rice paper. Tuck the fillings into this little pocket as tightly as possible and continue rolling to the end. Try and keep everything as tight as you can without ripping the rice paper. This will make it easier to eat. I prefer to cut the rolls in half. You get a bit more sauce in each dip, and because the ends are sealed, it doesn’t get everywhere quite a messily as dipping them from the ends and eating them that way. Although there is nothing wrong with making a mess. You could also opt to forgo the rice paper altogether and making a salad out of all the lettuce and herbs. It’s a great way to eat any leftovers and makes for a filling and healthy lunch the next day. Original Recipe from The Ravenous Couple.